The Prodigal Son or the Pedlar, 71 x 70.6 cm, 1495, Museum Boymans and van Beuningen, Rotterdam, (the original painting was rectangular, it was cut into a tondo by a subsequent owner). 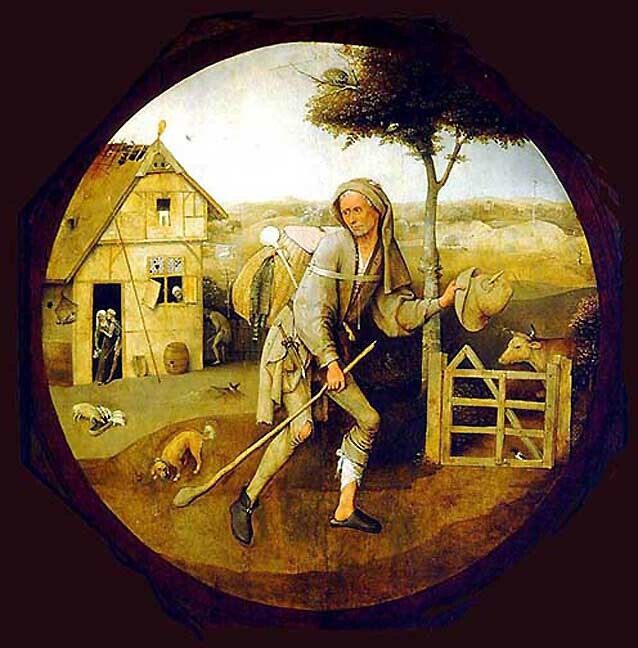 After an absence of 18 years (1477-95) an emaciated Jacob reappeared in Hertogenbosch, a vagrant in rags. 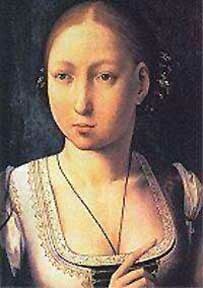 Bosch took his old friend in, and his sister weaned him from an opium addiction (my story). Followed by his faithful dog he is passing the whore house on the way to Vught. His magpie sits in the lowest corner of the cow gate. Bosch has surely enhanced the appearance of his revered friend and teacher. His return set the wheel of Fortune spinning. Bosch's production increased dramatically. 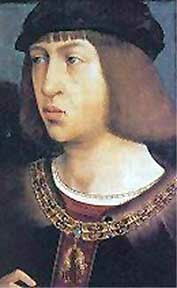 A year later Jacob was (forcefully) baptized by Emperor Maximilian I and his son Philip, Duke of Burgundy and Brabant. For good or bad Jacob entered recorded history. Death of the Usurer, 91 x 31 cm, National Gallery Washington DC. - The Ship of Fools, 56 x 32 cm, Louvre, Paris. - Allegory of Gluttony, 36 x 32 cm, Yale University, New Haven, CT All three panels and the Prodigal Son were cut from the same tree, 1494. In this case dendrochronology created a new triptych: The four panels must originally have belonged to the same painting, which was later ruthlessly cut and sold separately. The Gluttony panel is only a few millimeters thick. The circumstance that these three panels are thematically connected with the returning Jacob allows for a new simple, but daring interpretation beyond the usual observation that in the same year Sebastian Brant published his famous satirical poem Das Narrenschiff, the Ship of Fools: The usurer was Sibylle's father Noah who must have finally died in 1493/94, making Jacob's return possible. Noah had spent his life as a glutton (see his portrait in the Wedding at Canaa) riding about in a ship of fools! After Jacob's portentous baptism he could finally be elected under his Christian name Philip van Sint-Jans into the illustrious Confraternity of Our Lady in Hertogenbosch, the intellectual center of Brabant. This inauguration is documented. As an initiation gift Bosch painted two panels, depicting the two St. Johns, for an existing altar in the chapel of the Confraternity in Sint Jans Church. Meticulously this present was also recorded, but not its connection with Philip van Sint-Jans. 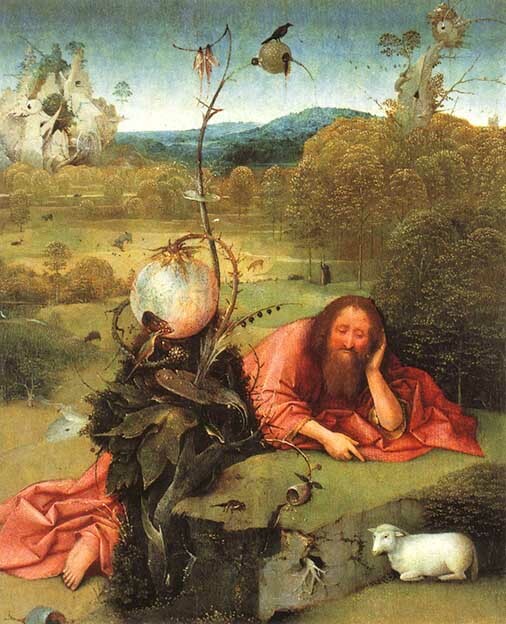 St. John in the Desert had been a rejected commission of Bosch's (1494?). Bosch overpainted the former client with a hideous black thistle and reissued the panel. 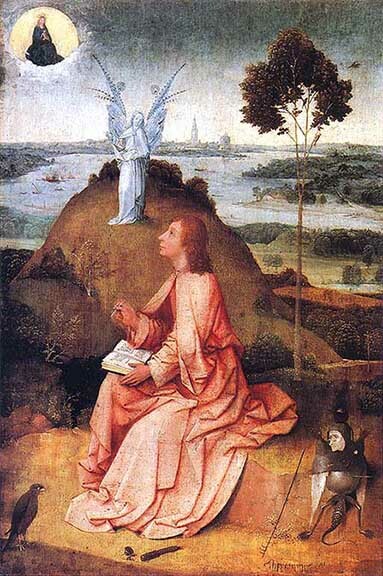 St. John Evangelist on Patmos, (signed), 63 x 43.3 cm, 1496, Staatliche Gemälde Gallerie, Berlin. The second panel for the altar of the Confraternity shows the Evangelist writing the Apocalypse. Even skeptics have noticed that St. John is the same man as in the betrothal scene of the Garden Triptych and the groom of the Wedding at Canaa: Jacob, the former Jew now Philip van Sint-Jans. Fraenger noticed what nobody had seen, Jacob writes from right to left, despite that both Jacob and Bosch knew that the original of the Apocalypse was written in Greek not Hebrew. Bosch wanted to make a (hidden) point. For a detailed description of the painting see the novel. St. John Evangelist on Patmos, Backside of panel, Christ's Passion, 63 x 43.3 cm, 1496, Staatliche Gemälde Gallerie, Berlin. The backside shows an intricate grisaille of the Passion of Christ, which circles like a clock around a pelican or ibis on a rock feeding its brood with its own blood. The connection of this theme with the newly baptized Jacob can only be explained by Bosch's concern about his friend's rage at his forced conversion by Maximilian I's, a political affront against the Archbishop of Cologne and the Brabantian nobles. 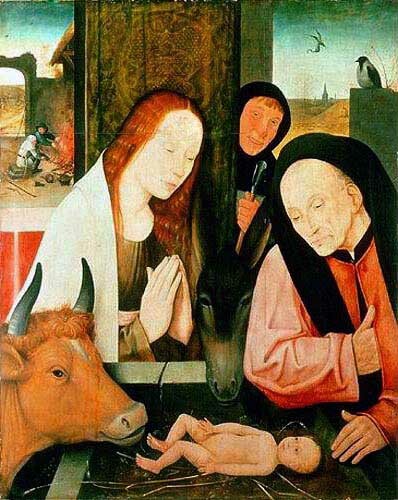 Adoration of the Child, 66 x 48 cm, 1568 (copy of a Bosch original, 1497), Wallraf-Richartz Museum, Cologne. 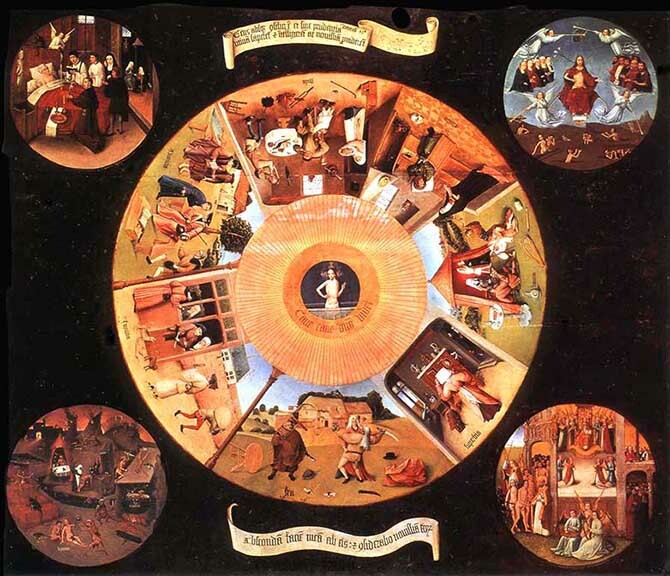 The Table of the Seven Deadly Sins, 120 x 150 cm, 1497 (wood not dated), Prado, Madrid. This ritual, probably sacramental table (Fraenger) plays a pivotal role in my novel. In my story Jacob used it to celebrate the Christian last supper among his students in Hertogenbosch. Its discovery set Jacob's downfall into motion. As possible as this may be, my reading remains fictional. Not fictional is the fact that Philip II had his connoisseur's eye on it and took it to the Escorial in the 17th century. A close examination of this reproduction will hopefully convince some modern viewers of my contention that the table was painted in Bosch's workshop, not by himself. However, the three inscriptions are significant: The two bands read, Gens absque; concilio est, et sine prudentia. Utinam saperent, et intelligerent, ac novissima providerent, and below, Abscondam faciem meam abeis, et considerabo novissima corum. In the center: Cave, cave Dominus vidit.— In the King James translation: "For they are a people void of counsel, neither is there any understanding in them. O that they were wise, that they understood this, that they would consider their end." Below: "I will hide my face from them, I will see what their end shall be." At center: "Beware, beware, the Lord sees you." Apparently these quotations have nothing whatsoever in common with the seven Deadly Sins or the Four Last Things in the corners. They are taken from Deuteronomy 32, 28-29 and 32, 20. Jacob must have chosen them, entirely for his own personal reasons. 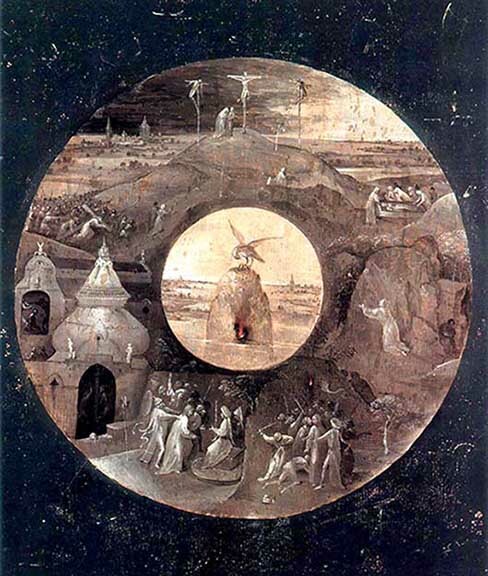 Five years later Bosch provided illustrations to the Deuteronomy text in the Temptation of St Anthony Triptych. 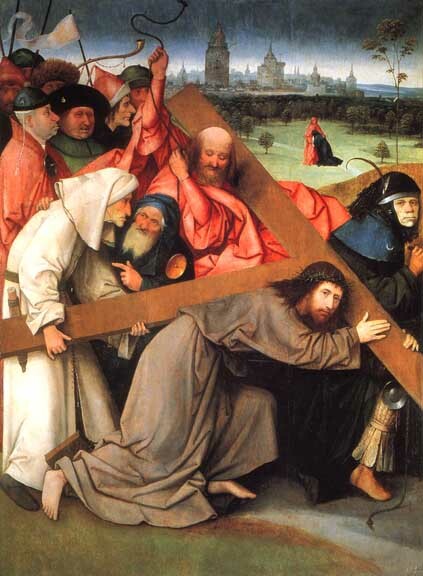 In the year 1499/1500 Bosch painted two panels showing Christ on his way to Golgatha. In both baptized Jacob appears helping Christ carry the Cross as if it was his own. I only show this one panel because it is the more beautiful. Admonished by an elderly Jew, dressed in a white habit as Simon of Cyrenea Philip van Sint-Jans doggedly forges ahead on his path. After the discovery of the Table times had become difficult, and Jacob was confronted with his Jewish faith as never before. Bosch's concern about his friend was growing. Where would Jacob's path lead them under the rising threat of the ubiquitous inquisition? 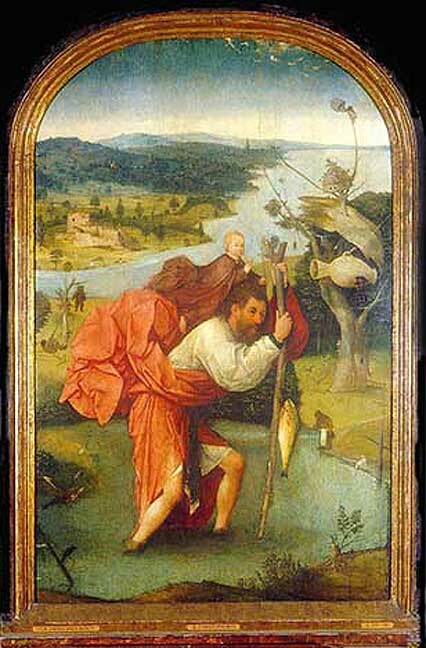 In between the Passion panels, just before embarking on a scatological fierce Temptation of St. Anthony Triptych Bosch painted this quiet pastoral St. Christopher, the patron saint of pilgrims and wanderers. He had decided to carry his friend into the safety of a pilgrimage along the Jacob's Way to Santiago de Compostela.